MyTwee visualizing a person’s Twitterverse. 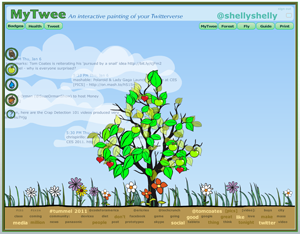 MyTwee is a flash-based interactive painting and lightweight social game that encourages people to make the world a greener place through their tweets. Each person’s Twitterverse is represented by a tree, with leaves and flowers representing people. The affective content of the messages generates fruit on the tree. MyTwee started as an interactive display at a People Doing Strange Things with Electricity art show, and then evolved into a fully featured interactive web site. MyTwee is no long available online.